You are at:Home»Camp Lejeune»Are Marines of 24th MEU in for a longer deployment? When the 22nd Marine Expeditionary Unit comes home to Camp Lejeune, N.C., in February, it will have been gone more than 10 months, a longer-than-usual deployment for a MEU, but not so rare anymore. Deployments have gotten longer. And now, as the 24th MEU conducts its own pre-deployment work-up and prepares to replace the 22nd MEU at sea, it’s still kind of a toss up as to whether its own deployment will exceed the traditional seven-month pump. As of now, the deployment is scheduled to be seven months, according to MEU spokesman Capt. Robert Shuford. 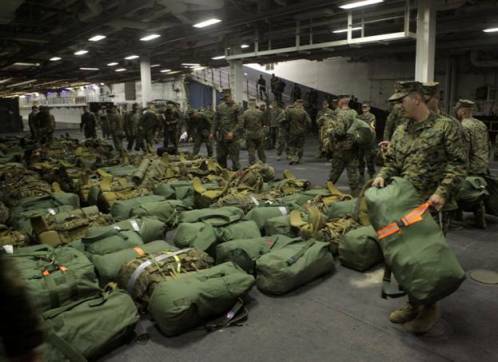 Some 2,100 Marines with the 24th MEU linked up over the past several days off the coast of North Carolina with Amphibious Squadron 8 for the second of their three-part work up before they deploy early next year. The Marines and sailors loaded their tanks, artillery pieces, helicopters and vehicles aboard amphibious assault ships USS Iwo Jima, USS New York and USS Gunston Hall using Navy hovercraft at Morehead City Port. Their current exercise — composite training unit exercise — will take them between North Carolina and Florida for several scenario-based missions, before it concludes on Dec. 21. In January, the 24th MEU will do realistic urban training exercises at Fort Pickett, Va.